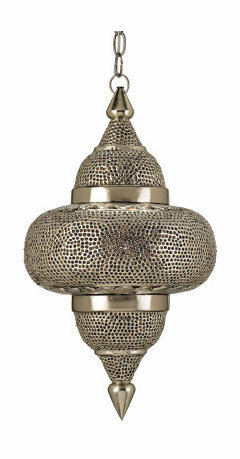 Southampton Moroccan - Mediterranean - Home Office - Houston - by Laura U, Inc.
A stunning room. Where did you get the Rajasthani style cabinet doors? - Can the cabinet door be made, latticed, purchaced? Beautiful Work Laura. 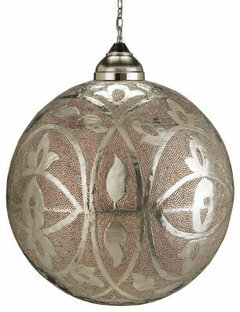 lindakaysep, the lanterns are made with a thin metal with hand-pierced work in a silver finish. We carry different styles and can ship nationwide. Please call or e-mail us and will be happy to help. @Laura U, Inc. I Googled Custom Mouldings in Houston and have not found a company by that precise name. Can you give more info on that source? Love the chair - where is it from? Can I ask where the lamps are from? I am looking to buy these exact ones. mammenjt, i have the same lanterns from many years ago. purchased through anthropologie online. 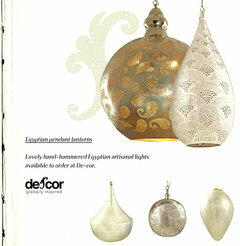 Where did you get the gorgeous hanging lights and are they available in other finishes? I sell these similar pendants by Currey if you are interested! Rug pops! Where is it from? I bought this rug in peacock (blue/green) 1.5 years ago. We love it. Where did you get the rug? Who is the manufacturer? Thanks. Where did you find the glass for the cabinets? Love it! Orange and hot pink. What could be a happier color combination than orange and hot pink? This palette isn't for the faint of heart. It's bold and whimsical. Consider this great color combination for a tween girl's room or a room with bright white walls. Exotic shapes and colors give this workspace the feeling that the owner has brought back beloved items from far-flung adventures. The geometric cutouts and accents are such a creative way to dress up a boring bookshelf. Add a few burnished lamps, et voilà! 1. Architectural details. Traditional Moroccan architecture is shaped by centuries of cultural and religious influences. Beautiful archways and curved doorways in the Islamic keyhole design are some of the style’s most recognizable elements. Get this look: Try adding these details through less permanent and less expensive paint finishes — just tape off your design on a wall, bookshelf or canvas, and paint over it in the color of your choice. 15. Add Moroccan flair. Inspired by iconic places like Majorelle Garden, interior designer Laura Umansky used shapes and repeating geometric patterns to bring an exotic bohemian Moroccan look to this Texas townhouse. Thanks to the unique millwork, textiles and grilles, one can easily imagine a Pucci-caftan-clad Talitha Getty lounging on the sofa.